The West Coast might not be as well known as the Garden Route but this doesn’t mean that it’s any less beautiful. Springtime (Aug, Sept and Oct) is particularly inspiring as the landscape blossoms in a surge of colour. This tour in mainly on-road, with some easy gravel road riding in the Cedarberge and the Northern Cape, as well as around Fish River Canon. After a hearty breakfast we’ll be making our way to Clanwilliam. We travel along the N44, crossing the Nuwekloof Pass. A few kilometers down the road another pass, Piekenierskloof Pass, is awaiting us. We follow the N7, via Clanwilliam to Vanrynsdorp and turn right towards Calvinia. Calviania is on the foot of the Hantam Mountains, and the portal to Namaqualand. We’ll stay in Calvinia for the night. From Calvinia we’ll be travelling through Namaqualand. This is a wide and beautiful semi-desert region, dotted with giant granite boulder stacks. Between these ‘koppies’ the outstretched savannah lands is the home of sheep and goat-farmers. Springtime in Namaqualand is from August to September. This is when the sandy plains transform themselves with wild spring flowers and burst into a kaleidoscope of colour. 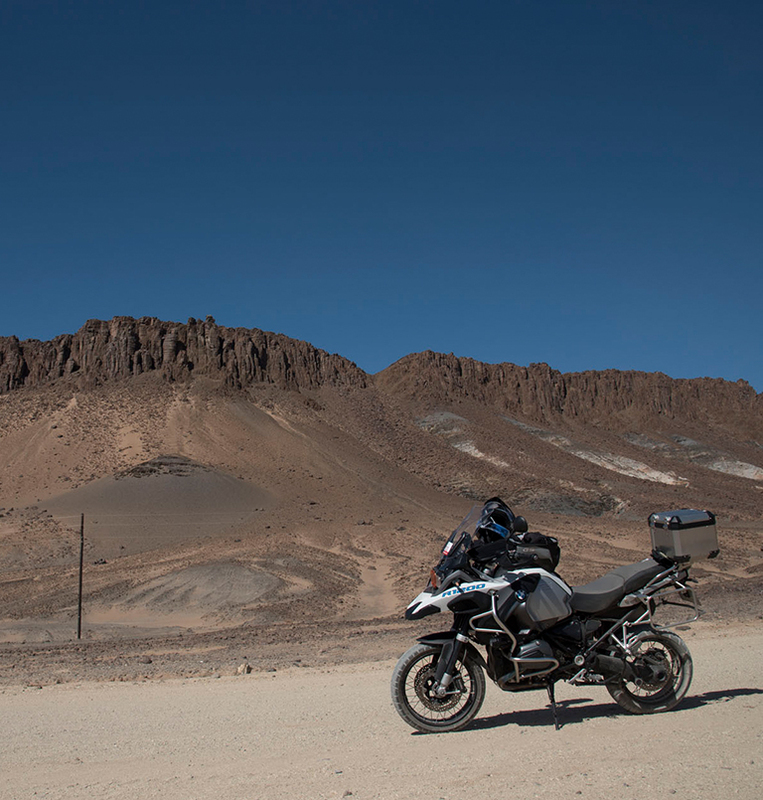 Our journey then takes us to the Orange River, which borders neighbouring Namibia, we leave Calvinia, and ride via Brandvlei and Kenhardt to Upington. 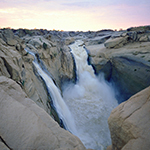 Just before we get to Upington, we’ll take a detour to visit Augrabies Falls, which is close to the Namibian border, and a stunning display of falling waters of the Orange River. Our guesthouse for the night, in Upington, is right on the river, and you can relax in their beautiful gardens. Upington is the capital of the Kalahari, from here we start to Namibia, riding via Grünau to the Fish River Canyon. 80 miles West of Upington we’ll cross the border to Namibia, we are now in the Kalahari, a semi-desert area in the South West of Namibia. Our destination for the evening is the Canyon Lodge at the Fish River Canyon. 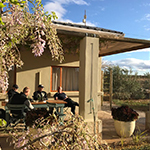 The Lodge lies within the private 100.000 ha Gondwana Nature Reserve, just 20 km from the main viewpoint of the Fish River Canyon National Park. Spaced amongst weather-beaten granite boulders are 26 bungalows, built out of natural rock. 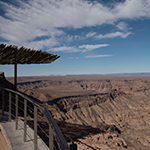 With its depth of up to 550 metres, the Fish River Canyon itself is the second largest canyon in the world, following the Grand Canyon in America. The enormous gorge winds along a distance of approx. 100 miles through the fissured Koubis massif all the way down to Ai-Ais. After breakfast, we’ll start the day with a stop at the main Canyon viewpoint for a few breathtaking views and photo opportunities. We’ll then follow the dirt roads along the eastern side of the Canyon in a southerly direction. Today, we will explore the world’s second biggest Canyon. Ai-Ais is another stop on our way, before we cross the border back to South Africa. 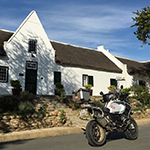 We will ride to Springbok in the afternoon to wash the day’s grit away South African style, with a cold beer or two. By now we have done quite a bit of riding, and a rest day is well deserved. 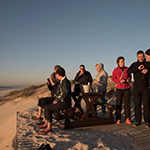 However, should you feel like more riding, the tiny village of Kleinzee is just 40 miles away from Naries Guest Farm and right on the West Coast. Should you wish to relax, there is a swimming pool at our guesthouse as well. Late afternoon, just before sun-set, we’ll be taking a drive to a view-point (optional), which allows us to conclude the day in style. The dinner will be served by our hosts. Today is the day that we make up for having spent so much time in the mountains as we head back south along the coastline. 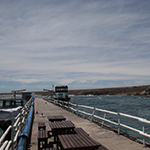 We’ll be travelling through towns like Kamieskron and Garies, partly on minor roads and part of the way on the N7 to the charming fishing village of Lamberts Bay. It is one in a chain of West Coast villages whose natural harbour has been developed slowly over the years. The most valuable catch is Rock Lobster or Crayfish as it is called in South Africa. Sometimes known as ‘red gold’ because the shell turns bright red when cooked. Seafood aficionados will be in heaven here. This is unfortunately our final day, the day that we’ll be making our way back to Cape Town. 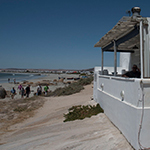 We’ll be travelling on minor and dirt roads through places like Vredenburg and Langebaan to Darling. Like man other South Africa towns that are named after leading members of the British colonial administration, Darling is named after Sir Charles Darling the Lieutenant Governor of the Cape Colony way back in 1853. 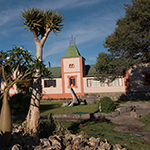 The farming village is home to one of South Africa’s most famous cabaret artists and satirists, Pieter Dirk Uys. He cleverly converted the town’s railway station into a theatre and supper club. Here he supports local artists by selling their wares as well. 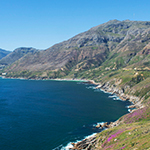 Cape Town is an hour’s drive away. 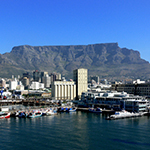 Motorcycles will be returned upon arrival in Cape Town. We will then either transport you to the airport or to your hotel or guesthouse. Please remember to let us know whether you would like to stay an additional night/s in Cape Town and we will make the arrangements for you. This will need to be paid for by you.